Both the igGrid and igHierarchicalGrid controls feature row selection in the grid. 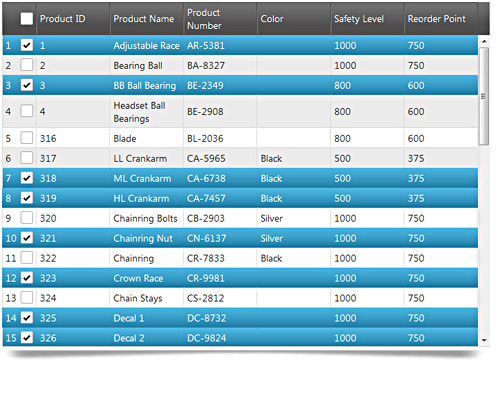 Using row selectors you can configure the control to select single or multiple rows in the grid. You may also optionally enable row numbering with row selection. Further information regarding the classes, options, events, methods and themes of this API are available under the associated tabs above. Determines whether the row selectors column should contain checkboxes. Determines whether the row selectors column should contain row numbering. Determines whether the selection feature is required for the row selectors. If set to "false"
The seed to be added to the default numbering. will let the feature decide the best width depending on enabled contents. The row selector column width can be set in pixels (px) and percentage (%). The row selector width can be set as a number. Determines whether checkboxes will be shown only if row selectors are on focus/selected. Event fired after a row selector checkbox had changed state. Use ui.row to get reference to the row the clicked row selector resides in. Use ui.rowIndex to get the index of the row the clicked row selector resides in. Use ui.rowKey to get the key of the row the clicked row selector resides in. Use ui.rowSelector to get reference to the row selector cell. Use ui.owner to get reference to igRowSelectors. Use ui.grid to get reference to the igGrid the igRowSelectors are initialized for. Use ui.state to get the state of the checkbox ("on","off"). Use ui.isHeader to check if the header check box is the one being clicked. In this case no row related args are passed. Event fired when a row selector checkbox is changing. Use ui.currentState to get the current state of the checkbox ("on","off"). Use ui.newState to get the new state of the checkbox ("on","off"). Event fired after a row selector is clicked. Use ui.fixedRow to get reference to the fixed row the clicked row selector resides in(if there are fixed columns). Classes applied to the checkbox container. Classes defining the unchecked state of the checkbox. Classes defining the checked state of the checkbox. Classes applied to the row selectors footer cells. Classes applied to the row selectors header cells. Class defining the hover state style of the node. Classes applied to the row selectors grid cells.